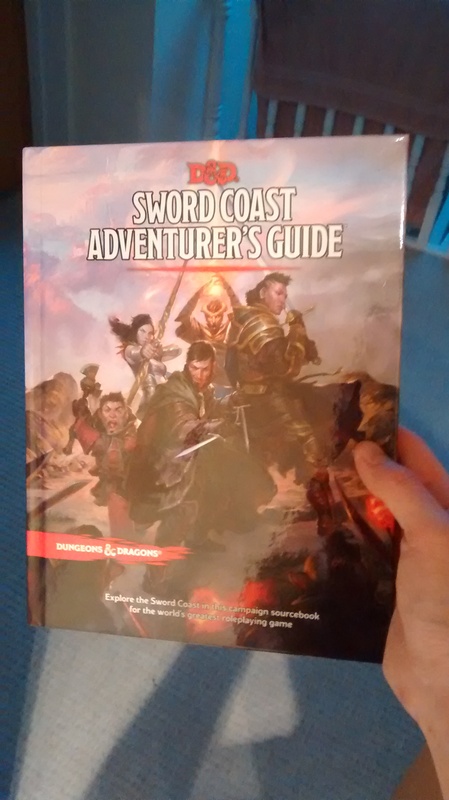 Yesterday I received the Sword Coast Adventurer’s Guide, the latest d&d book. Unlike the three core books, this is mostly just background and history for the Forgotten Realms setting, but there’s a few character options and backgrounds too. A good 3/4 of the book is non-game mechanics: history, geography, gods and more. It all centres around the Sword Coast, part of the Forgotten Realms, and probably the most famous D&D setting. The Sword Coast covers Baldur’s Gate (of computer game fame), Neverwinter (same), Waterdeep (known to boardgame geeks) and various other cities, forests, swamps and mountains. There’s enough content to provide ideas for a few hundred campaigns, although that’s assuming everyone is equally invested in the Realms. I like the idea of fitting campaigns into an already established world, especially one that many people are already quite familiar with. However this section of the book is really too detailed and too vague at the same time. The Sword Coast is actually a fairly massive area (and detail is also given to surrounding areas and countries too), but giving just a single page write up for a city like Waterdeep is too little to really give much more than a flavour of the place. The book falls into an unnecessary middle ground: you need a fair amount of imagination to flesh out the world, but if you’re inventing your own stories, why do you need that much detail in the first place? Much more excitingly (at least for me), the book also contains several new class options, spells and backgrounds. Everyone’s opinion will vary, but there’s some great ideas and some not so great. There’s new class options for the Barbarian, Cleric, Fighter, Monk, Paladin, Rogue, Sorcerer, Warlock and Wizard. Some are a little uninspired like the new totem options for Barbarians or the Paladin-of-Lawful-Stupid. However some give a new spin on the standard class. The Swashbuckler Rogue for example, now excels in single combat and brash swinging-from-the-chandeliers manoeuvres and is no longer forced to orbit a fighter to get sneak attacks. The Undying Warlock is a nice idea, giving the character mastery of death and undeath, and even a feature that lets them reattach severed body parts! I think my favourite is the SpellSinger Wizard, who adds to the Fighter-Wizard spectrum, being a more combat-focused Wizard (as opposed to the Eldritch Knight). I’m not sure how variable the class could be however, as you’re essentially forced to build around dexterity. There’s also a grand total of 4 new spells, all cantrips, and all “for those who favour casting spells in melee”. While a few more options would have been nice, they give a lot of power to classes like Eldritch Knight, which is fine with me! I don’t know how I feel about this book. It has some great content, and a load of filler. Some of the formatting is maddening too: maps that fall across two pages (forcing interesting areas into the crease), area descriptions in an almost random order (so you lose track of where various places are), and an inconsistent art style. If you love D&D you already own it. If you’re thinking of buying it, borrow it from a friend first, or buy a copy for the group to share.